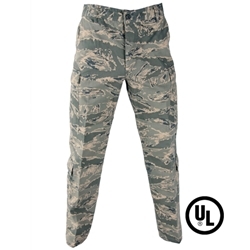 The PROPPER NFPA-Compliant ABU Trouser is sewn to military specification FQ PD-06-11B and can be used with unit commander approval for personnel requiring fire-retardant fabric. Certified to NFPA 1975 standards for station/work uniforms for emergency services (2009 edition) by Underwriters Laboratories, Inc. Features felled seams throughout for enhanced durability and fused collar and pocket flaps for a clean, professional look. Made in the USA. •Certified to NFPA 1975 Standards by Underwriters Laboratories, Inc.